E-T-A ElectroTechnical Applications has extended its range of electronic overcurrent protectors with the ESX10, an efficient device for the protection of DC 24V circuits in factory automation environments. Measuring only 70mm high and 12.5mm wide, these overcurrent protectors feature purely electronic trip characteristics and active current limitation. 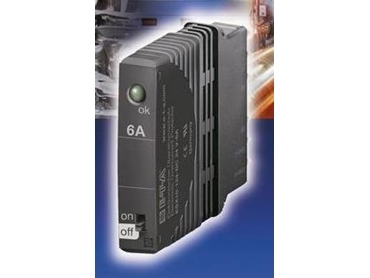 A choice of seven ratings from 1 to 10A is available, ensuring that the integral fail-safe element will be optimally adjusted to the connected cable cross sections and that the cables will be protected according to standard requirements. Suitable for use in automation applications such as tool or packaging machines, ESX10 overcurrent protectors are particularly useful for machinery that requires a reliable and selective disconnection, and where there is an integral safety technology, such as a safety PLC, also in use.